Redustat with Orlistat is a Fat Blocker which blocks nearly 30% of the fats that you eat. 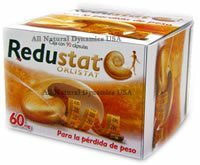 Redustat active ingredient is Orlistat which is indicated for the treatment of obesity and to lose weight for women and men who are obese or overweight. Orlistat blocks the fat that you eat keeping it from being absorbed and converted into fat by your body. Orlistat is used to help in weight loss and to help reduce the risk of regaining weight already lost. Orlistat must be used together with a reduced-calorie diet. With Redustat the undigested fat is not absorbed into your body and is passed out with your feces (stools). It works by blocking chemicals (enzymes) in your stomach which digest the fats in the foods that you eat. Nearly 30% of the fat that you eat is blocked by Redustat. How Much Weight Can I Lose with Redustat? Studies have shown that on average men and women can lose equal to or greater than 10% of their body weight once completed a treatment ranging from 3 to 6 months. Some people can lose 10% or more of their body weight within 3 months with the help of Redustat. Redustat is indicated for men and women 18 years and older, for the treatment of obesity, for weight loss and maintenance treatment with a hypocaloric diet control. It is also indicated in patients who have risk factors associated with type 2 diabetes mellitus, obesity, hypercholesterolemia, hyperinsulinemia, glucose intolerance and hypertension. Is Redustat Indicated For People with Diabetes? Redustat is indicated as an additional control of blood glucose in patients with type 2 diabetes mellitus are overweight or obese, were treated with hypocaloric diet control and oral hypoglycemic drugs or insulin. Does Redustat Have Any Contraindications? Redustat is contraindicated in persons with hypersensitivity to orlistat which is the main ingredient. It is also contraindicated in patients with chronic malabsorption syndrome and those with cholestasis. Redustat does not interact with alcohol, digoxin, nifedipine, oral contraceptives, phenytoin, pravastatin, statins, warfarin or metformin. Should I Take a Multivitamin with Redustat? In order to assure adequate nutrition while taking redustat, it is recommended the use of a multivitamin which should be taken at least two hours after administration of Redustat. We recommend taking Vivioptal vitamins one capsule daily while taking Redustat. Can I take Redustat During Pregnancy and Lactation? Redustat is a category B pregnancy risk. It is not known whether orlistat passes into breast milk, which is not recommended during lactation. Therefore Orlistat should not be administered during pregnancy. How Do I Take Redustat? The recommended dose of Redustat is one capsule of 60 mg orally 3 times a day with meals.The same dose isused in adults and adolescents (over 18 years of age). We recommend taking Redustat before meals or up to one hour after meals maximum. Doses greater than 60 mg three times daily have shown no additional benefit. You do not need dose adjustment in elderly patients with renal or hepatic function.